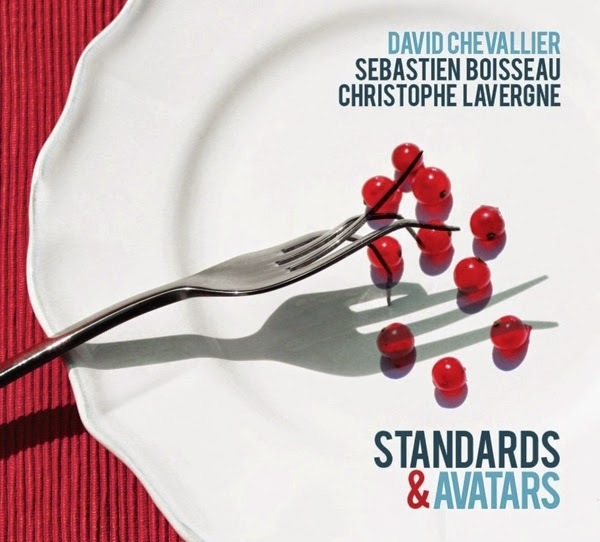 If Standards are pieces of music that have gained importance within the musical canon of jazz then it might be interesting to posture what the Avatars might be that accompany them on this album by David Chevallier. A religious connotation of the term within Hinduism relates to a spiritual being or deity, although I doubt that is what’s meant in this context, whilst in computing ‘avatar’ refers to the alter-ego of the user generally depicted in graphic form. So what it seems we have here within this set of pieces is a collection of standards that also contain an alter ego or at the very least a response to them that has been developed by David Chevallier. These counterpart pieces do not necessarily come across as a critique of the standard but more as a second self that has come to life from the prompt of the original material. The album contains instrumental versions of well-established pieces such as All The Things You Are, and What Is This Thing Called Love? As well as a rendition of Miles Davis’ Solar, six of the standards contain an avatar title as well, which appear to poke fun at their more established brethren such as The Man I Love / Is Actually a Woman! and You Don’t Know What Love Is / Oh Yes, I Do! With a line-up of Sébastien Boisseau (Bass), Christophe Lavergne (Drums) and David Chevallier (Guitar) this guitar trio really gets into some great playing. Chevallier for the main part has a nice clean but crisp tone on his guitar but not without aversion to more overdriven sounds when mixing it up in the more improvised passages where the music really comes to life. His playing is excellent and there is interesting use of harmonies to well-known passages as well as the deconstruction of material such as on Strange Fruit. It’s good to hear well-worn material being used to inspire more modern post-bop and freer playing, whilst grounding the more ‘outside’ sections that might not have worked quite so well without their structured forebears. Once in a while you stumble across an album that not only did you not have any preconceived ideas about but you didn’t actually know about at all, which then turns out to be an absolute gem! This is one of those rare instances. A really great album that ought to be more widely heard, containing some great music from a fresh perspective.